Our classic rainbow toe socks are a favorite with kids. Each toe is wrapped in fun rainbow colors made of soft acrylic and spandex for comfort and softness. 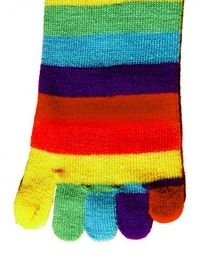 Your kids will love these fun Foot Traffic rainbow striped toe socks! Super cute socks! Very well made and they feel great. My little girls toes are so small they don't quite fit. She needs to grow into them. Otherwise, she loves them!